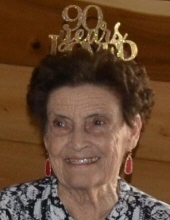 Doris Hudson, age 90 of Moran, passed away Thursday, February 7, 2019. Funeral services will be held at 2 p.m., Monday, February 11th at the First Baptist Church of Moran with Rev. Jeff Pleasant officiating. Interment will follow in the Moran Cemetery under the direction of Morehart Mortuary. Visitation will be held from 4 p.m. to 6 p.m. on Sunday, February 10th at Morehart Mortuary of Albany. Doris Marie Kidd was born February 2, 1929 in Coleman, Texas to parents, Alton Boyd Kidd and Fleeta Olive Sikes Kidd. She graduated from Coleman High School in 1947. Later that year on September 28th, Doris married Jack Kenneth Hudson. She was a member of First Baptist Church in Moran and would often help with Vacation Bible School. Doris enjoyed cooking and loved spending time with her grandchildren. She was preceded in death by her parents; her husband; one son, Russell Shane Hudson; one brother, Alton Lee Kidd; one sister, Beulah Faye Kidd Straach; one son-in-law, George Eberle. She is survived by five children, Kenneth Michael Hudson and wife Sally of Ranger, Larry Jack Hudson of Grand Falls, Debbie Sue Hudson Rumage and husband Jim of Breckenridge, Randall Dee Hudson and wife Teri of Moran, Becky Leigh Hudson Hollabaugh and husband Rodger of Breckenridge; two sisters, Betty Kidd Vaughn, Patricia Kidd Cates; sixteen grandchildren and thirty-one great grandchildren. Memorials may be made to the Juvenile Diabetes Research Foundation and may be left at Morehart Mortuary. Condolences may be left at www.morehartmortuary.net. "Email Address" would like to share the life celebration of Doris Hudson. Click on the "link" to go to share a favorite memory or leave a condolence message for the family.